Where can you see Mount Everest from? You don't have to spend years preparing to climb the worlds tallest mountain to get a glimpse of Mount Everest. Contrary to popular writing you don't even have to go on a trek to Everest Base Camp to see it. On this page is a list of places where you can see Mount Everest close up or as dot on the horizon. Each one is rated based on how good the view is on a good weather day. More details on these plus more can be found below. Highlights: You'll get to come eye to eye with the world's tallest mountain on an 8-12 seater plane. More information & tips: Morning flights are best to see Mount Everest. Flight are often delayed or postponed due to bad weather so it's worth putting aside two days just incase day one is cancelled. Refunds are offered if your flight is cancelled. Weather plays a factor with mountain flights so avoid monsoon season for flights. 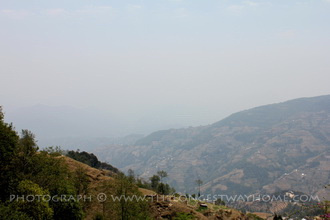 Nagarkot: An easy walk to a viewing platform just outside of Kathmandu city. Highlights: Travel to the hillside town of Nagarkot and see the Himalayan mountains for sunrise and sunset. More information & tips: Nagarkot is easily reached independently by taxi or bus from Kathmandu city or even closer from Bhaktapur. 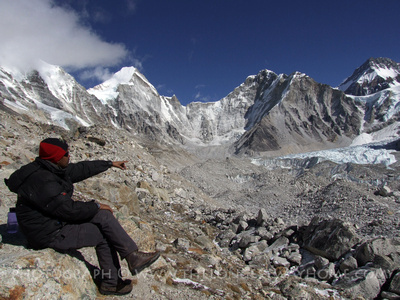 Many tour operators both local and online offer Everest viewing packages. A short hike in the morning brings you to a crowded look out tower. While the impressive Himalayan mountains are often visible Everest itself is no more than a tiny dot. Rating: A good way to see the Himalayan mountains for those short on time but not to actually view Everest. Dhulikhel Hike: A short comfortable walk with several well known lookouts over the Himalayas. Highlights: Similar to Nagarkot but with more culture via the town. Everest is again barely visible but the Himalayan range is. Dhulikhel is easily reached independently by taxi or bus from Kathmandu city or Bhaktapur. It's not as popular as Nagarkot with package tours as there not as many hotels that tour operators partner with. It's a little further away from Kathmandu too but its on a main road so this is not an issue. Dhulikhel is well worth a nights stay due the old temples in the area with a sunrise hike to see the mountains. Rating: A great way to see the Himalayan mountains and visit a Newari town for those short on time. Again like Nagarkot Everest is nothing but a dot. Chandragiri Hills: A newly opened (2016) privately owned cable car with lookouts over the Himalayas. Highlights: Cable car, Bhaleshwor Mahadev temple (Shiva). Everest is not visible on anything but a crystal clear day and at that it's a distant spec unless you bring binoculars etc. There is a Himalayan range visible but it's a distant one. You can take a very local bus from Ratna Park out to Godam Chaur then walk 30+ minutes out to Chandragiri hill station. Getting back similarly. Otherwise it's a private taxi ($30-40+ rtn or private tour). The owners are at http://www.chandragirihills.com. Rating: This is a new private company who have made a nice cable car with mountain views. However, it's very weather dependant even for a snow capped mountain view. Good for those looking to take a chance or have extra time in Kathmandu. Unfortunately their pricing is discriminate with non-Nepali paying over double the cost. Everest Base Camp Trek: A famous and epic trek that culminates in seeing Everest at the famous base camp used by summiteers. Duration: 12 + days. 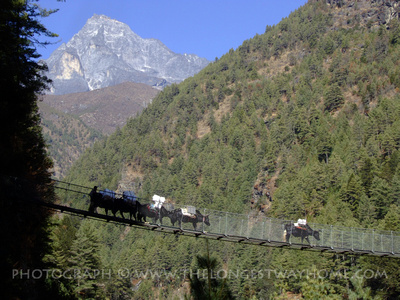 Fly into Lukla then begin the trek through Phakding, Namche Bazar, Tyangboche, Dingboche, Lobuche and Gorakshep. 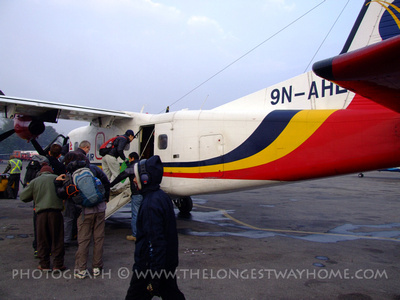 Highlights: The flight to Lukla, one of the world's shortest runways on the side of a mountain. There are several stops along the way to see Everest. Climbing Mount Kala Patthar (5, 545 metres (18, 192 ft). There are several places along the way where you get to see Everest. The best is of course at base camp. However, do make sure you climb Mount Kala Pathar beside base camp for the best views. Rating: A classic trek and the best way to see Everest. Is it worth going half way to see Everest on a trek? Jorsale and Namche: Cut the Everest Base Camp trek short by taking a 2 days trek to see Everest. Duration: 3-4 + days. Fly into Lukla then begin the trek through Phakding, Jorsale and Namche Bazar. Highlights: The flight to Lukla, one of the world's shortest runways on the side of a mountain. Two views of Mount Everest. Just after Jorsale the trees open up to reveal the first good look at Mount Everest from a distance. Later about Namche Bazaar you get a slighter closer view near the Everest View Hotel. Rating: Two views of Everest from a distance plus some of the trekking experience ... the real question is why would you come all this way without going all the way! 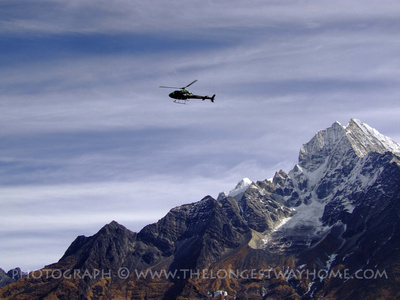 Helicopter flight: Similar to the Everest flights you can hire a private helicopter to get up close next to Mount Everest. Highlights: You'll get a unique look at Mount Everest that few others will with a better chance of great photos than the plane flights. More information & tips: Morning flights are best to see Mount Everest. The cost can be shared with up to 5 people. Taking photographs from a helicopter is slightly easier than the mountain flights. Book in person rather than online to save costs. Weather plays a huge factor here so you'll need to set aside a couple of days to avoid cancellations. Rating: The premium way to see Everest. Note: some tour operators offer helicopter flights to Mount Everest Base Camp itself but they are nearly double the price and come with the risk of acclimatization sickness. Please note permits for Tibet are needed when entering from both the Nepal side and Chinese side. Read more on how to travel to Tibet overland. 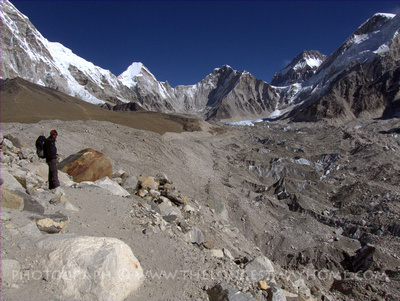 Overland from Nepal to Tibet: Get a very brief view of Everest on the overland route to Tibet. Duration: 8 days (30 minute viewing). Highlights: You'll get a very brief look at Mount Everest when you stop along the overland route. More information & tips: During a routine stop along the overland route you might be lucky enough to have some clear weather and catch a glimpse of Everest from the Tibet side.. Rating: Not worth it "just" to see Everest. Everest Base Camp (North / Tibet side) : Drive all the way to a starting point then take a one day trek to Base Camp. Duration: 1 + days not including driving time. Highlights: Nearly reach base camp by jeep then get up close to the Tibetan side of Mount Everest. More information & tips: At first glance it seems easier and cheaper to see Everest from Tibet. The reality is that there's a lot more travel involved along with hassles with permits and expenses in getting there which can only be done via an organized tour. Rating: If you are traveling from Tibet to Nepal via a tour it's worth paying for an additional night visit base camp. Otherwise the bureaucracy and logistics lets this side down greatly. Taking jeep most of the way also seems to take away the "wow" and accomplishment that is felt on the Nepal side. Climb Mount Everest : Drive all the way to a starting point then take a one day trek to Base Camp. Duration: 7 days + 3 months. Highlights: Being on top of the world! More information & tips: A climb to the top of Mount Everest should not be taken lightly. Do read more about how to climb Mount Everest. Rating: No better way to see Everest up close! The above list of treks in Nepal is continually being added too based on popularity or request. If looking for a trekking guide I recommend you read my article on How to find a trekking guide in Nepal or use my Find a local trekking guide service. If you want to book a trek of flights here is a list of recommended treks to book online.